Google launches Chrome Remote Desktop app available in web store. 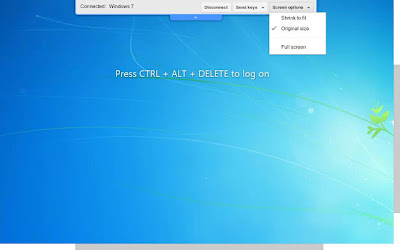 Chrome Remote Desktop app is allows to share your desktop with others (or) remotely control others computer through Chrome browser and Chrome book over the internet. You have to install chrome remote desktop on every computer you want to access remotely. Use latest version Chrome browser and Windows , Mac, Linux computer to use Chrome Remote Desktop app. To share your computer or access someone else's computer that has been shared with you, both computers must be connected to Internet. First install Chrome Remote Desktop app to your computer from Chrome Web Store. After finished installation a new tab opens then with Chrome Remote Desktop app click on this app to run. 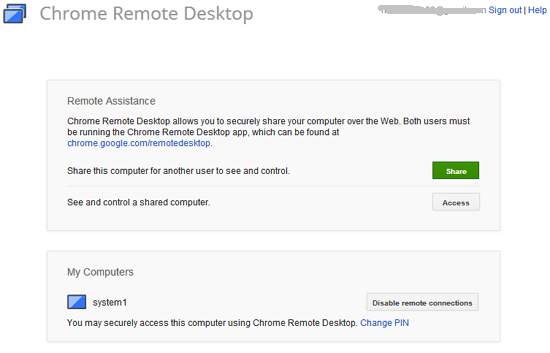 When you launch Chrome Remote Desktop app for the first time, will ask to email authorize it. Click Get started button then click Enable remote connections. Enter PIN and re-type the PIN click ok. Click Yes to install the Chrome Remote Host Service. The host service will be downloaded and installed automatically. confirm the Google Account and enter the PIN again to continue. The computer you enabled shows up under “My Computers”. You can access any remote connection enabled computers with the same Google Account at anywhere.